(Washington, D.C.) The U.S. Postal Service revealed five additional subjects to the 2019 Stamp Program and Tennis Champion Maureen Connolly Brinker, Artist Ellsworth Kelly and the Transcontinental Railroad are among the new additions. This issuance honors extraordinary tennis champion Maureen Connolly Brinker (1934–1969). 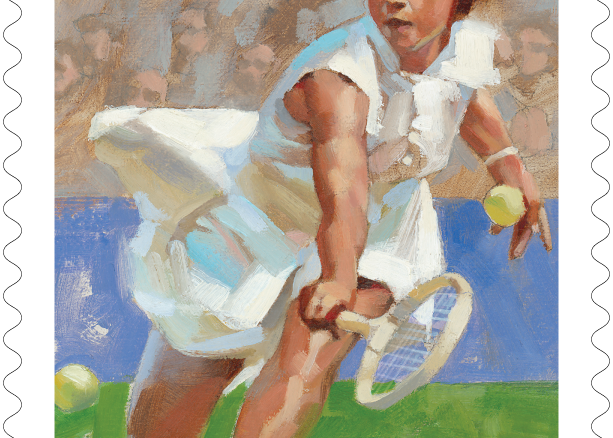 The stamp art features an oil-on-linen painting of the tennis star by Gregory Manchess. Based on a black-and-white photograph taken in 1952, the portrait is a colorful interpretation of Connolly hitting a low volley. Nicknamed “Little Mo,” the 5-foot-4-inch dynamo used powerful groundstrokes to become the first woman to win all four major tennis tournaments in a calendar year. Art director Derry Noyes designed the stamp. This issuance honors artist Ellsworth Kelly (1923–2015). Kelly pioneered a distinctive style of abstraction based on real elements reduced to their essential forms. His artworks include paintings, sculpture and works on paper. The 20 stamps on the pane feature 10 pieces, each represented twice: Yellow White (1961), Colors for a Large Wall (1951), Blue Red Rocker (1963), Spectrum I (1953), South Ferry (1956), Blue Green (1962), Orange Red Relief (for Delphine Seyrig) (1990), Meschers (1951), Red Blue (1964) and Gaza (1956). A detail from Blue Yellow Red III (1971) appears in the selvage. Derry Noyes served as art director and designer for this issuance. railroad, a massive engineering feat that reduced travel time across the country from as many as six months to about one week and made the American West an integral part of the nation. Two different stamps feature the Jupiter and the No. 119 locomotives that powered the trains carrying the officers and guests of two train companies to the “Golden Spike Ceremony,” held when the two rail lines were joined at Promontory Summit in Utah. A third stamp portrays the famous golden spike that was a prominent part of the ceremony. Art director Greg Breeding designed the issuance. Michael J. Deas painted the Jupiter and No. 119 stamps. Kevin Cantrell illustrated the stamp depicting the ceremonial golden spike and did the border treatments and typography for all three stamps.